‘HIGHER EUDCATION IS A NECESSARY AND INCREASINGLY VITAL COMPONENT IN ANY NATIONS DEVELOPMENT. THE UNIVERSAL DECLARATION OF HUMAN RIGHTS AFFIRMS THAT ‘EVERYONE HAS THE RIGHT TO EDUCATION… AND HIGHER EDUCATION SHALL BE ACCESSIBLE TO ALL, ON THE BASIS OF MERIT’. 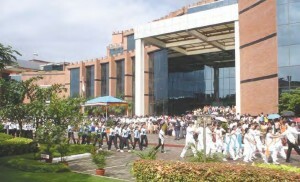 India’s higher education sector presents an interesting scenario of challenges and contrasts. On the one hand is a painstakingly built network of government colleges, universities and institutes, which is arguably one of the largest in the world, on the other hand is a rapidly increasing demand for its expansion. Similarly, on the one hand is a role envisioned for it of a harbinger of development for the masses, on the other is its potential to compete in the global market.These are only a few of the many unique aspects of the sector that has seen policy makers reinventing ideas and plan, while inspiring new partnerships for the local and global private linkages.In this feature we try to place India’s tryst with higher education in its historical and current context by highlighting the challenges and promises that many say make the country a leading contender..
Enrolment into colleges and universities has been increasing at an impressive rate since ndia’s political independence. The last decade witnessed the fastest growth in gross enrolment ate. From 2.75 million in 1980-81, it increased by four times to 11.03 million in 2005-06. Fig. 1) The institutional capacity has logically gone hand-in-hand with this trend. This reflected in the number of universities and institutions of higher learning. In the period of ive decades, between 1950 and 2008, the number of universities increased from 25 to 431, number of colleges from 700 to 20,677 and number of teachers from 15,000 to over 5.05 lakh. The number of students n higher education institutions increased from mere one lakh n 1950 to over a 10 million. (Fig. 2) Besides this, India’s population will grow from 1.02 illion to 1.31 billion from 2001 to 2019, the significant aspect of this growth is a projected hange in the demographic composition of population in the 18-24 age group. This implies hat people eligible for institutions of higher education will increase from 113 million (11%) in 001 to 144 million (12.1%) in 2011. The demand for higher education is, therefore, xpected to increase, requiring new infrastructure to accommodate an influx of students. Both f these aspects, in terms of future policy trends, imply that the growth of infrastructural support for higher education will have to not only continue, but its pace will ave to grow by leaps and bounds. A realisation of the enormity of the challenge is reflected in olicy indicators and announcements by government and government agencies. For instance, he National Knowledge Commission in India has recommended opening nearly 500 universities to accommodate this influx of population. The magnitude of infrastructural rowth needed to begin addressing the demands of increase in gross enrolment rate is expected to place calls for massive resource mobilisation besides strong political will. This ealisation in the past decade-anda- half has set the stage for discussion on Private Public artnerships (PPP). 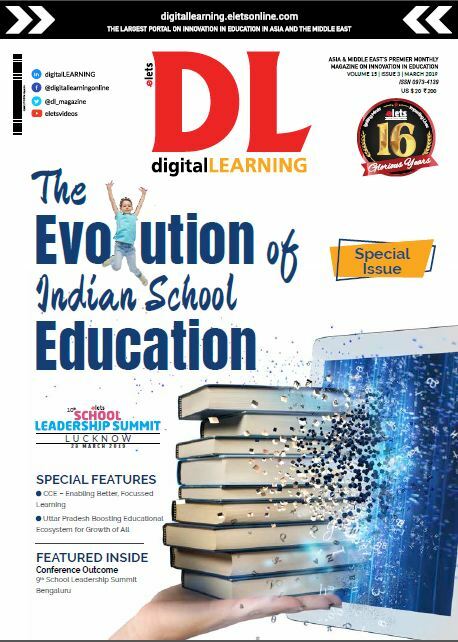 This concept has been a buzz word for a while now and through ollaboration of the service providers, educational companies, state-owned institutions has een reation of a positive environment. Balancing act: Private and Public lthough the government run or supportedinstitutes of higher education have been the mainstay of the ector, the state investment in the sector has not been increasing in the liberalisation era. This oincides with the increasing push by the private sector in creating a market. Private players today provide quality education to a substantial number of students and the content s tuned towards the market needs, but comes at a price that most people in the ountry cannot afford. Commercialisation of education has raised concerns over exorbitant apitation fee for admissions; lack of uniformity in fees; undue advantage to some groups in admissions; reduced access for marginalised groups; lack of accountability; entry of pseudo- ducational ventures; lack of qualified teachers; and catering to subjects that ‘sell’. The need to have private resources and players mobilised for keeping up with demands of higher ducation infrastructure and yet address the need for keeping a levelled playing field for arginalised sections is a dual challenge that has seen a lot of debate and discussion. 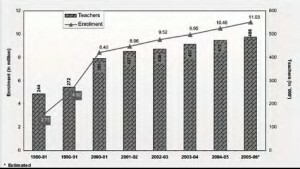 Inconsistencies and contradictions in the policies and practices of private education management led to a spate of judicial interventions down the years, for example, the J P nnikrishnan judgement (1993), TMA Pai and others versus the State of Karnataka (2002) and Islamic Academy of Education and others versus the State of Karnataka (2003). Meanwhile the Birla-Ambani Report (2000) submitted to the previous government made a call for an all-out privatisation. In spite of contending views on the relevance and methodology of privatisation of higher education in India, it is widely recognised that the State should be primarily responsible for ensuring quality education at all levels in all regions. At the same time, the State should encourage through futuristic vision the facilitation of planned interventions by the rivate sector. To prevent commercialisation of education, transparent and unambiguous policy guidelines for the private sector are essential. Although current practices such as the establishment of universities by state legislatures, entry of foreign universities, and unwarranted growth of self-financing courses in universities are effective in enhancing educational opportunities, such practices require clear-cut policies in their management structures. Addressing challenge of development India’s education system and particularly the agenda of higher education have been heavily influenced by the reality of underdevelopment and poverty of India’s majority. One of the role that was envisaged for higher education during the Nehruvian era of state sponsored educational growth was to create pool of people who will answer India’s quest to make development available to its millions of poor households. Indian higher education is sensitive to the issue of sustainable development through the promotion of livelihood practices ensuring sustainability, reducing poverty, educating women and children and in fostering respect and interest in environmental protection. The thrust given to agricultural universities, Women’s Studies progamme, vocational education programmes are some examples of this. Presently, there is a mismatch between the skilled manpower required and what is available. Every year millions of graduates pass out of colleges who do not have the specific skill sets required by the market. To change this situation, the government is working on a proposal to develop Industrial Training Institutes through the private-public partnership (PPP) model. Introduction of short-term modular courses and issuing scholarship reimbursable vouchers to institutions that focus on skills development are the other important initiatives planned by the government. The 11th Plan has set an ambitious target of creating 70 million jobs between 2007 and 2012. Enriching from globa l outlook Higher ducation institutions are actively expanding the international dimension of their teaching, esearch and service functions. Cross Border Higher Education (CBHE) refers to international, nter-cultural and inter-disciplinary aspects of curriculum and the eaching/learning process and is reflected in increasing mobility of students, programmes, eachers, researchers, and institutions. This trade in education has resulted in medium and ong term benefits for India, in terms of its large number of students acquiring better ducation and specialised skills and the teachers and researchers being exposed to new urricula, delivery practices, and increasing specialisation in their disciplines. // COVER STORY According to Ernst &Young-EDGE 2009 Report on Private Enterprise in Indian Higher Education, the share of private unaided higher education institutions has increased uring the 10th Plan and is expected to grow further through the 11th Plan. Reduced public pending along with rising demand for higher education have primarily led to the growth of rivate sector in education. However, the percentage of GDP spend n higher education has eclined from 0.77% in 1991 to an estimated 0.7% in 2008. The share of expenditure spend on higher education as a percentage of total education expenditure has remained stagnant at pproximately 19% over the past two years. The extent of private sector involvement in igher education colleges varies across major states with approximately 63% of the colleges in ndhra Pradesh being private unaided. The education market in India is estimated to be pproximately US$ 50 billion, with higher education occupying US$ 20 billion share. By 012, t is estimated to grow by US$ 80 billion. The private sector has a leading presence in few selected disciplines such as engineering, medical and management. The market size of rivate engineering colleges is US$ 5.4 billion (approximately 84% of the US$ 6.5 billion rivate olleges market), followed by management with US$ 680 million (approximately 0%) nd medical with US$ 350 million (approximately 6%). In the professional courses segment, private management colleges are expected to grow by 100% from 300 to 600 by 012. Number of engineering colleges is expected to grow by 67% to about 2000 and medical colleges to grow by 43% to around 200 by the same period. The report pin-points to five major factors responsible for growth in demand for private higher education in India, amely: Inability of the public university system to meet the demands of growing population. Conventional courses not geared towards creating employability. Increased purchasing power for high cost private education. Declining trend of public expenditure on higher education. overnment policies to enhance privatisation. Table 2: Types of Operation of oreign Institutions in India n of a foreign institution in the domestic market.